girl was named Fantine by "the first random passer-by, who had encountered her, when a very small child, running bare-legged in the street." She moves to Paris at the age of 15 to seek her fortune. "She was a lovely blonde, with fine teeth," wrote Hugo, adding she had "gold and pearls for her dowry; but the gold was on her head and the pearls in her mouth." Her teeth are a constant theme of Hugo in describing the young woman: "Her splendid teeth had evidently received an office from God -- laughter." While her hair and teeth are her crown jewels, Hugo expanded on his description of his heroine: she is "brilliant of face, delicate of profile, with eyes of deep blue, heavy lids, feet arched and small, wrists and ankles admirably formed, a white skin which, here and there allowed the azure branching of the veins to be seen, joy, a cheek that was young and fresh ... a strong and supple nape of neck, shoulders modeled as though by [the sculptor Guillaume] Coustou with a voluptuous dimple in the middle, visible through the muslin; a gayety cooled by dreaminess; sculptured and exquisite -- such was Fantine." February 21, 2013 -- "I would have pulled out my teeth to play Fantine," actress Anne Hathaway said in a recent interview. "It was such a dream, and I can't believe I'm the girl who got to play her." 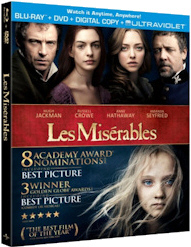 Hathaway was referring to her role as Fantine in the motion picture "Les Misérables," based upon the book of the same name by French author Victor Hugo. Published in 1862, the story has been adapted to the big screen four times (1935, 1958, 1998, and 2012). The novel -- an indictment of post-Napoleonic French society circa 1830 -- is considered one of the greatest of the 19th century. The well-respected American author Upton Sinclair called it the sixth greatest literary work of all time. "Les Misérables" is up for the Best Picture award at this year's Oscars, and Anne Hathaway is nominated for Best Actress in a Supporting Role for her portrayal of Fantine. Image courtesy of Universal Studios.